Maremma Mixed Flower honey, a bee product craftmade using an entirely natural honeycomb centrifugal extraction method. The honey is neither heated up, pasteurised nor treated in any way. 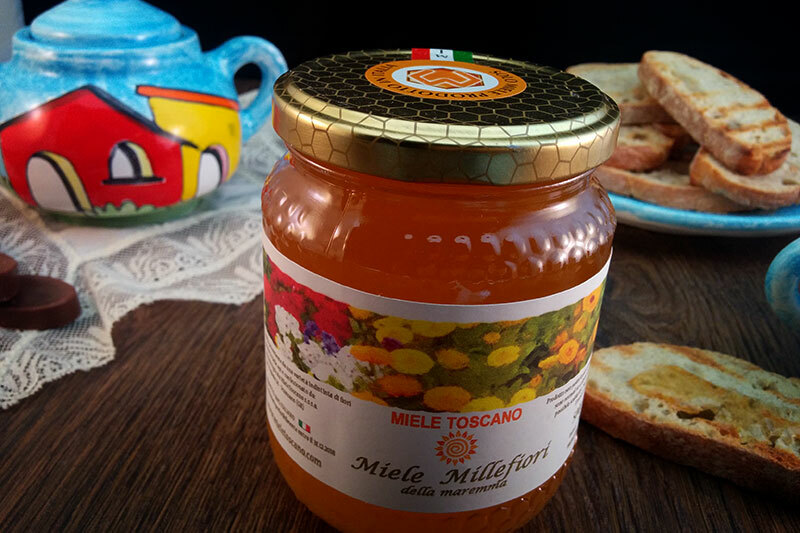 Our Maremma mixed flower honey comes from a generalised mass of flowers, thus its flavour and colour varies from year to year, something which does not happen with single-flower honeys, in which both colour and flavour remain constant. When it is taken out of the honeycombs, the honey is liquid and then over time, as the temperature goes down, it crystallises. This is due to the presence of glucose within the honey’s sugars and to wholly natural chemical-physical processes which do not change the product’s properties in any way. Maremma mixed flower honey is the preferred honey of the majority of consumers, because it has higher fructose than glucose levels and is perfect at breakfast and for snacks, while at meal times it is ideal with fresh cheeses and fruit salads. Maremma mixed flower honey is also particularly suitable for children (over 18 months of age) as it helps fix mineral salts in the human body, something which normal sugars cannot do. Honey has many therapeutic properties, which vary according to the nectar of the flowers it has been made from. In general honey is an excellent throat anti-inflammatory and has sedative effects on nervous excitement and insomnia. Our ‘wholemeal’ honey is never the same twice. Every lot is different from the last, because every hive makes a honey all its own! Sometimes it is amber coloured and fluid, at other times it is very pale and crystallised: it all depends what the bees do. Try it on its own and you’ll soon see why it is called ‘food of the Gods’. Organoleptic characteristics: Pale amber colour tending to straw yellow. Delicate perfume. Liquid in summer but crystallises in cooler weather.